I cannot believe we are about to be in March. Time flies when you're crazy busy! No matter how crazy, it's an exciting time for my son as he will be making his First Reconciliation and First Communion soon. And, I love that all of these big moments are happening during this Lenten season. I've done chocolate, fast food, and social media - well, let me be honest. I intended to "give up" these vices, but...FAIL. I recently saw a post about giving up what's REALLY interfering in your life. And, as a person who deals with daily anxiety, I love anything beneficial to my well being. This year, I am fighting harder (because I know me, it won't be easy) to GIVE UP these five things for Lent this year - and not just for the 40 days but beyond this season, too. As a blogger who puts herself out there, you can easily start comparing. My content won't reach anyone. My blog views are nowhere near what I want. Basically, I am not as good as the others I see. If I do this comparison thing too often, I lose the focus on why I share in the first place - which is talking ALL the parts of this mom life. Comparison won't bring me anything but more anxiety. And God knows I do not need anymore of that! This time with my son has opened my eyes to how much more we need to be prayerful. More than anything, I want him to get in a routine himself of being grateful and knowing where to turn. In one week, he will confess his sins - which he says are pestering his sister or talking too much at school - but he will know God forgives. Prayer is powerful, y'all. Story of my life. My daily battle. I turn 40 this month, and I don't see worry exiting my life completely. And, I am a mom so there's that. But, I want to be more alert to when the worry comes and how to combat it. The fitness, the writing, and the faith - they will be my main weapons when worry appears. Since my brother died last year, I have had quite a hard time forgiving. I not 100% confident in sharing a lot just yet, but those close to me know this stage I am in. Basically, I'm mad and too stubborn to stop. Healthy, right? During this Lenten season, I hope to dig deep - as painful as it may be - to find forgiveness. God does not want me to feel this way, but it's not easy for me. I pray that tearing down this wall will leave me so much lighter. February 28th also marks the 15th anniversary of my dad passing. I don't see it as a coincidence that it falls on such a Holy week of reflection. This amazing daddy of mine taught me that worry got me nowhere and to watch my money. And, I know he'd get a kick of this blogging thing, too. He loved that I loved to write. He is my inspiration for this post. Actually, he's my inspiration for life, really. Thank you, Daddy. What can you give up now and beyond Lent to improve YOU? I would appreciate prayers in this journey and would love to pray for you - we are in this together. Lord knows I cannot do it alone! Have a blessed week and a blessed Lent, too! 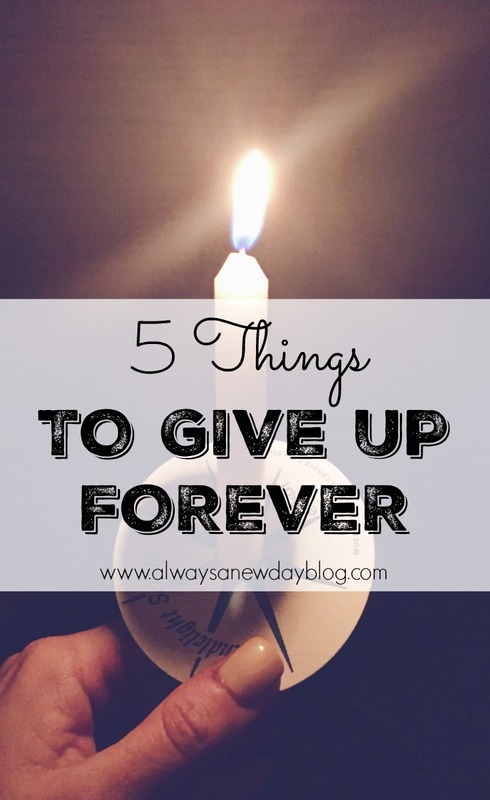 I am very taken by this idea of giving up things that are getting in your way of spiritual growth. This practice can start with Lent and take you such great places beyond that. I lost my daddy almost 11 years ago. Miss him every day! Something new for me this year, too Sending hugs to you! I gave up soda several years ago and started drinking more water. Talk about feeling better. I have found if I give up something and replace it with something better or positive this helps. These are fabulous things to give up...for life!! I'm going to join you...thank you for these ideas...and my heart is with you on a tough anniversary. Thank you, friend! I'd love some support because I know it won't be easy. The older I get, the more I realize how important it is to let things go as fast as possible. I want to be present to experience the joy, peace and love of life. The things you listed all take you away from happiness and purpose. I need to add that - let it go ASAP. I love your perspective!